Home / Parenting / Is eating bacon during pregnancy okay or not? What expectant mothers should keep in mind is that while there immune system is fully developed and strong enough to fight off many potential infections (bacterial, viral and fungal), the immune system of their bay is still developing and more susceptible to infections. During pregnancy, the mothers are advised to take prenatal vitamin supplements because their body requires more nutrition for the proper growth of the baby. The first thing pregnant women are advised to focus on when they find out that they are expecting is a proper nutritious diet because what they consume not only effects there health but also the health of their baby. Some foods like saturated trans-fat and alcoholic drinks are to be strictly avoided during pregnancy because they cannot only lead to a complicated pregnancy, but can also cause developmental defects in the baby. The consumption of some other foods like bacon, for instance, is a highly debated topic; although it has some healthy attributes at the same time it also has many harmful constituents. Many are of the opinion that eating bacon is safe during pregnancy as long as it is eaten in moderation and is properly cooked. Before we jump into health benefits and harmful effects of bacon during pregnancy let’s talk a little about bacon first. Bacon is a meat product that is prepared from several different cuts (pork lion or pork belly) of pig meat and is often cured. Bacon is cured with large amount of salt and the result is called fresh or green bacon. Bacon can also be dried in cool air for several weeks to months or smoked to form dried bacon. Bacon is a famous side dish for breakfast in North America. It is also used in small quantities in burgers and sandwiches. Brain power: Bacon is full of an essential nutrient called choline that helps the development of brain. It helps enhance memory and fight the debilitating effects of Alzheimer’s disease. Choline is especially important for expecting mothers because it helps the growth of the baby’s brain. Stops food cravings: Bacon is rich in saturated fat content so it fill you up faster than carbohydrates. This means you’ll eat less but feel full. Many researches support the belief that if a person shifts to a high fat and low carb diet (calories must be in the reference range) then this will help reduce weight in the long run. Low carbs: Bacon is comprised of less carbohydrates and contrary to popular belief, carbs are the reason behind obesity not saturated fat. The low carb energy obtained from bacon helps raise one’s metabolism. High in protein: Bacon might not have as much protein as other meats, but the proteins in it are of extremely high quality. Proteins are made up of amino acids and bacon contains one of the highest amount of essential amino acids. Bacon contains the following amino acids: tryptophan (which is important for brain health), glutamic acid (vital for the nervous system) and leucine (helps to build muscles). Source of selenium: Selenium is a nutrient that acts as a potent antioxidant and protects the body against various disease. Selenium along with vitamin E helps protect the eyes against degenerative disease. It also plays an important role in thyroid development of the fetus. Full of phosphorus: Phosphorus is the building block of DNA and ATP (energy currency of the muscles). Proper level of phosphorus in expectant mothers is really important for the development of the baby. Vitamin B: Bacon contains vitamin B and it and it is used by the body to convert carbohydrate into glucose, so it can be used by the body. Vitamin is really important for expectant mothers because it helps in development of the nervous system of the baby. Risk of infection: Bacon may contain listeria monocytogenes (bacteria), which can cause listeriosis and trichinella (roundworm) that can cause trichinosis. Both these organisms may cause infections in expecting mothers because the immune system of pregnant females is altered. These infections can lead to stillbirth, preterm labor, miscarriage or serious infections in the baby. Listeriosis is one of the primary rationale behind why expecting mothers are cautioned about bacon. While eating bacon expectant mothers should make sure that the bacon they are consuming is from s reliable source and should be properly cooked. Sodium: A significant amount of sodium is naturally present in bacon and large quantity of sodium is used to cure bacon. So bacon is a sodium rich food product. A slice of bacon contains about 190 mg (milligram) of sodium and the daily requirement of sodium is about 2300 mg (milligram). So if you eat 5 slices of bacon your already at the half mark of daily sodium requirement, this is a thing to ponder on considering the various source of sodium in our diet. High level of sodium intake can cause hypertension (high blood pressure), increased risk of heart and kidney disease. High level of sodium increases the risk of stroke. High blood pressure can cause many complications during pregnancy including miscarriage and preterm labor. Saturated fat: Bacon is rich in fat and most of which is saturated (bad) fat. Each slice of bacon contains up to about 1.18g (gram) of fat and approximately 1g (gram) of this fat is saturated. Saturated fats accord to increased risk of chronic health problems like diabetes and congestive heart failure. High level of saturated fat in diet leads to narrowing of the blood vessels due to deposition of cholesterol in them. These narrowed vessels increase the risk of stroke and heart disease. High fat diet can cause various complications during pregnancy. Preservatives: Bacon is a processed meat, so a few preservatives are always used in it. Nitrates and sorbates are the two most readily used preservatives in bacon. Nitrates have a potential carcinogenic effects once they enter the digestive system. Nitrates produce varying nitrosamine compounds in the intestine, which may enter the blood stream and damages the internal organs. Sodium nitrate is a highly toxic ingredient and USAD tried to get it banned but the notion was vetoed by the food manufactures. Why do manufactures still use it even if they know how harmful it is? It’s simple because it gives meat a reader color and makes dead meat look fresh and vibrant. Sorbates are added to meat so it does not change taste and color and it is associated with headache. Woman need to understand that during pregnancy the normal physiology of their body undergoes a significant change that can make them more prone to infections. Furthermore, some infections during pregnancy can be more sever, which could otherwise have been mild. Infections can lead to miscarriage, preterm labor, and developmental defects in baby or maternal death. To further complicate the matter, some of the medications used to treat the infection may cause harm to the fetus. The increases risk to infection is due to the altered immune system and the change in the hormone balance. The immune system helps protect the body against invading foreign antigens, ranging from bacteria, virus, cancer cells or transplanted organs. The human body has several layers of defense against invading pathogens. The first layer of defense is the barriers, mucous membrane and skin, the prevent entry of pathogen into the body. A collection of different cells like NK cells, T cells and macrophages fight against invading pathogens to prevent infection and to kill the infected cells. The immune system also induces cells that recognize specific antigens and cells that form antibodies to kill those antigens. During pregnancy, a woman’s immune system changes not only to protect them and the baby from infections and disease, but also to protect the baby from the maternal immune system itself. In theory, the fetus is regarded as a transplanted organ that the body sees are foreign, so to prevent the body from attacking the fetus the immune system is altered. While some parts of the immune system are enhanced (like macrophages) other parts a suppressed (like T cells), this helps prevent infections and also lets the body adapt to the pregnancy (4, 5). 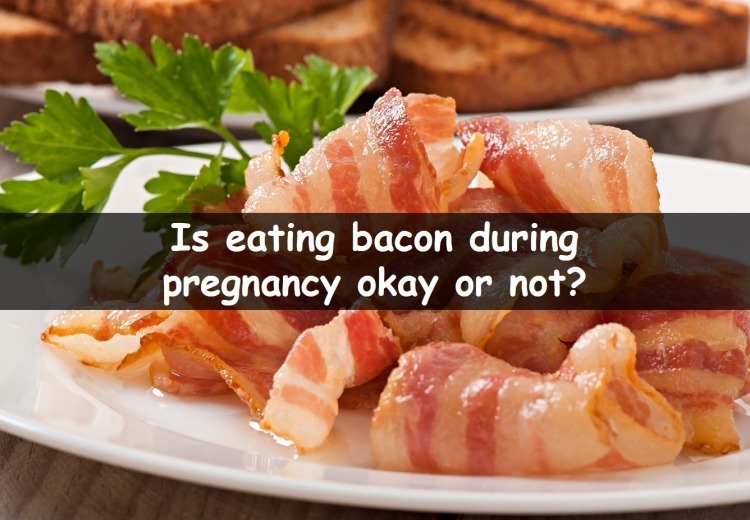 While it is unlikely that eating bacon can cause problems during pregnancy, you should still know that to look out for. There are two main pathogens in pork meat that you should be aware off and you should also know what symptoms they cause. Trichinella: This is genus of roundworm that cause trichinosis. The species that are predominantly present in pigs are T. spiralis and T. britovi. When raw or poorly cooked bacon or any form of pork is eaten, the roundworm enters your body. Trichinosis is a parasitic disease and shows no symptoms in mild infection. Intestinal invasion of this parasite leads to diarrhea, abdominal pain and vomiting. If the parasite enters into the muscle tissue it can cause edema (swelling) on face, fever, splinter hemorrhage, muscle pain and rashes. If any of these symptoms occurs after a while of eating bacon then contact your doctor and if you’re pregnant. You should be more vigilant because untreated trichinosis can lead to miscarriage. This parasite is easily killed by heat so if the meat is properly cooked than the risk of trichinosis is relatively low. Listeria monocytogenes: It is a bacteria that is found in raw pork meat and it cause listeriosis. Pregnant woman are at a high risk of listeriosis and the symptoms can occur as late as two months after eating contaminated food. The primary symptoms of listeriosis in pregnant females are mild flu-like, general lathery, weakness, upset stomach and headache. It can also involve central nervous system and gastrointestinal tract which can lead to fatal infection. Listeriosis during pregnancy is alarming because it can lead to stillbirth, miscarriage, premature birth and fatal infections in the newborn baby. How to properly cook bacon? For expecting mothers, it is really important that when they eat bacon it should be thoroughly cooked that means it should be crispy and red in color. It is cautioned for pregnant females that bacon should be eaten well-done if possible. Make sure to check for any “cold spots” where the bacon has not been cooked properly. It is advised to cook bacon on a stove or in an oven to make sure it is thoroughly cooked instead of microwave oven. When eating leftover bacon make sure to reheat the bacon to at least 165 F (Fahrenheit). This is done to make sure that any potential bacteria in the meat is killed. Everyone should practice safe food handling especially expecting mothers. When handling bacon it should be kept in mind to separate cooked bacon from uncooked bacon and also keep the meats and vegetables separate. It is also advised to thoroughly wash your hands before and after handling of meats like bacon. Turkey bacon: Turkey bacon is by far the most commonly used substitute for pork bacon. Turkey bacon unlike pig bacon has a less fatty belly, so turkey meat has to be ground up, smoked and reformed in bacon like strips. It does not shrink as much or might not be as crunchy but it is low in fat and cholesterol. Turkey bacon has the same juicy richness of pork bacon. Chicken bacon: This type of bacon is mostly used in Muslims countries. Chicken has less fat and requires less sodium for curing, so it is a healthy alternative for people who are restricted to a low fat and low salt diet. Each slice of bacon contains more protein and less calories than pork bacon. Lamb bacon: Lamb belly is cut into stripes and cured. It has almost as much fat as pork bacon but when cooked it does not become as crispy. The lamb bacon is cut into narrower strips than pork bacon. Vegetarian bacon: Fakon and vacon are other names of vegetarian bacon. This is alternative that is available in supermarkets for people who do not like meat bacon. This type of bacon is made up off tofu or tempeh. It has no cholesterol and small quantity of fat but it is high in dietary fibers and proteins. Eat fresh and whole foods that are cooked by you. Most restaurants use substandard oils and meats and vegetable that are long past their prime. This can not only lead to infections but it also does not fulfill your dietary requirements. Pass over processed, pre-packed and canned food instead buy fresh vegetables, fruits and meat. Instead of buying dried bacon, make it yourself from fresh pork. When buying bacon or ham make sure to pick the product that is nitrite free. Buy food items that have natural preservatives like ascorbic acid, citric acid and salt instead of synthetic preservatives. Make your own cold cut meat for sandwiches instead of buying processed cold meat. Organic all the way. The safest and easiest albeit not the cheapest way to avoid preservatives is to use organic food and food products. Bacon like any other thing in this world has both good and bad aspects. Whether the good aspects outweigh the bad or vice versa is an ongoing debate. The use of bacon during pregnancy is highly debated, most people say that eating small amount of properly cooked and preservative free bacon every now and then during pregnancy is safe. Large quantity of bacon is harmful and should be avoided especially by expecting mothers.